It's truly incredible to me that many folks - even country folk that should know better - will kill the snakes in their yard. ...then you should hope you have snakes! Think about it this way: which do you prefer? Snakes are natural pest control! As a top-end predator, snakes are essential balancing agents in your garden, yard or farm. Rather than killing them, we should deliberately create habitat. Rock, stick and log piles create good places for these vermin destroyers. I can hear some of you now: NO! Creating snake habitat is... SCARY! I mean, what about rattlesnakes??? C'mon, don't be a wuss. Seriously. Unless you have rattlesnakes around your property, you're probably going to be fine. Their favorite place to live is generally gopher tortoise burrows. What you want is to leave space for good guys like rat snakes, black racers, garter snakes, ring necks, king snakes, etc. They'll manage your pest control, plus add some slithery beauty to your homestead. I recommend you get familiar with the good guys. 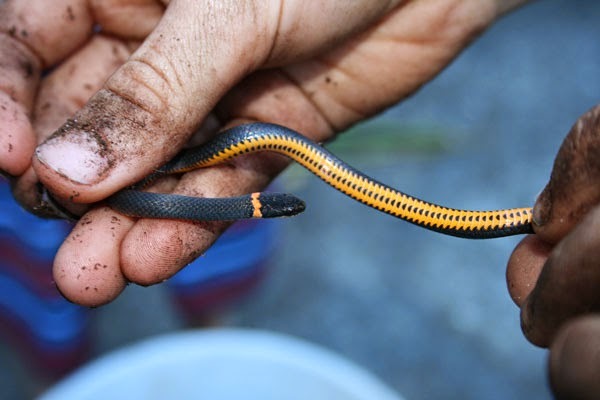 Heck, pick up a good field guide... maybe you'll start thinking snakes aren't so bad after all. 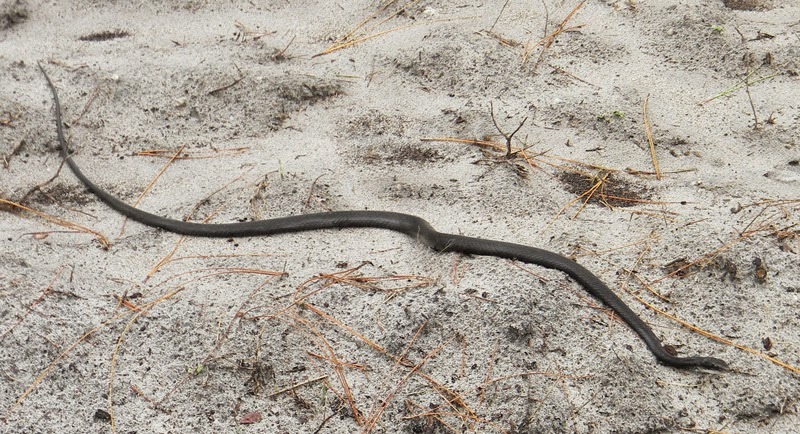 We love our resident indigo snake! But we have family members who will hardly step foot on our property because of the *possibility* they might see a snake or lizard. Cue the eyeroll. One of the very first things we taught our son about being outside was to watch where you step. Once he mastered that, we don't worry. Indigo kingsnakes are wonderful - I haven't seen any of those here yet. And yes, watching where you step isn't all that hard. I've been bitten by snakes (granted, when I was catching them on purpose) and even if it happens, it's not that big a deal. No reason to be a chicken. Missouri wisdom says if you have a black snake living in your yard, you can be sure you won't have any copperheads. They don't coexist. Does this sort of thing apply to snakes native to other areas? We have two blacksnakes and a king snake living on our property. Only had one copperhead in the last 7 years -introduced him to my bushhog! We also have a lot of brown worm snakes that live under the leaves. They are shiny brown, thin, about 4 to 9 inches long. We thought at first they might be copperhead babies, but they did not have the yellow-orange tip on their tail. Protect your snakes! Yellow jackets are a lot more dangerous! Our property is in the swamp, we have them all. Can't say I like any of them. I'll let the racers go, but if it's venomous, I make no promises. We've had two dogs bit on property in the last year. One by a pigmy the other by a water moccasin. I also had a very close encounter with a moccasin coiled up and ready to strike me in the face, inside my chicken coop!!! It also killed three of my hens. We've recently brought in some semi-feral cats to help with the rodent and snake issue we face. There isn't a week that goes by when we don't spot a venomous or non-venomous snake on property. To highlight another story, I grew up in WI and was struck by a snake while running around bare foot. I had to have a shot in my leg to ward off any diseases it carried and was left paralyzed from the waist down for two weeks. I hate snakes! Sounds like the shot paralyzed you. Yikes. That's totally scary. I'm not a fan of moccasins, though the pygmies don't bother me. Dogs seem to find ways to get bit. Moccasins are nasty creatures. I draw the snake line at them. Worm snakes! I'm jealous. I love those weird ones. It's probably the black kingsnakes they're thinking about. There are a lot of kingsnake varieties, and - in my knowledge - all of them will eat other snakes, including poisonous ones. We are just now starting to see snakes in our yard after more than two years. I personally think it's because our compost and brush piles are attracting mice, but we have hawks and owls hanging around too. Can't complain about that. I like your style, Phacelia. Thank you. I found this post to be very good. I have already gone through and read many of your posts. They are fantastic! It is crazy to think that snakes are natures natural pest controllers. I think I will stick with their human counterparts though. When I think of pests, it makes me happy that there is an entire industry devoted to eliminating them.